Welcome to a new series of posts that will describe how to build a Boggs 3-slat post and rung side chair. Brian designed this chair to fit a human form as comfortably as possible and, if you build one, it will surely be one of the most comfortable wooden chairs you ever sit in. Although the design has its roots in traditional Appalachian ladderback chairs, its graceful curves allow it to look at home in contemporary as well as traditional settings. Over the years Brian has refined the process of building chairs and I will explain the elegant and simple methods he has developed as well as talk about the principles that underly those methods. Together the methods to build this chair and the principles behind them form an excellent introduction to the craft of ladderback chairmaking. I will start at the beginning with log and lumber selection and move through the process in a stepwise fashion. Along the way I will explain in detail every aspect of building this chair including steam bending, shaping parts with draw knife and spokeshave, turning, drilling angled mortises into curved parts, understanding grain orientation and wood movement, assembly with hide glue, seat weaving, finishing, and more. I will also venture into related topics such as tool sharpening and even making some custom chairmaking tools. 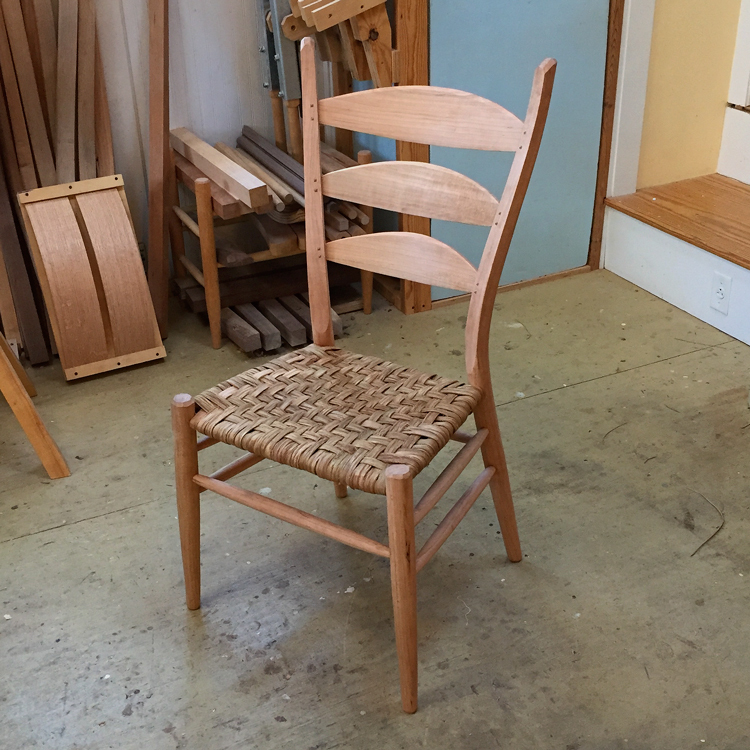 Over the past couple of years I have been teaching students how to build this chair in six day classes in my shop in Strasburg, Virginia. There are some concepts, such as drilling angled rung mortises, where the process is simple to execute but the underlying principle is difficult to explain. For me, the classes have been an ongoing opportunity to refine and perfect how to communicate in ways my students (and you) can understand. In working with students I have found it is very helpful to break down each process into small discrete steps. The student can focus on doing that small step well before moving onto the next, each step building on the last. And there have been times where I’ve expanded or modified the steps after watching a student struggle. These refinements in process become part of the way I teach. For this series I will describe processes in much the same way as I do in class—in a step-by-step methodical fashion, explaining how-to, pointing out pitfalls, showing you what to look for and how to evaluate what you’ve done. My hope is that this series will become a comprehensive reference on how to build a ladderback chair using the methods that Brian has developed over a 30 year career in chairmaking. I plan on posting once a week and encourage you to comment and ask questions as we go. Building a chair like this is a very satisfying experience—and you have a comfortable, hand made chair to sit in once you’re done!